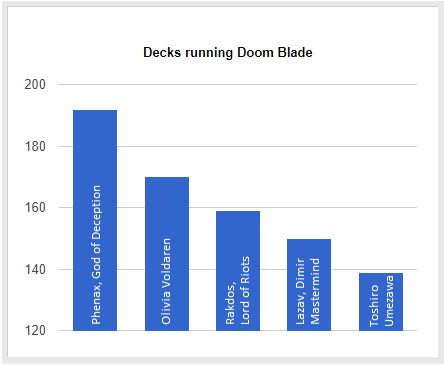 Currently, there are 7,782 decks in the EDHREC database running Doom Blade and not a single one of them should have it as part of the 99. Welcome back to In the Margins, a periodic column where I sometimes lie about cards and whether you should consider running them. This time though, I’m telling the truth. Mostly. I think. I mean Doom Blade isn’t very good. It’s mediocre. Middling. Tepid. You know what dies to Doom Blade? Bad memes. You know what doesn’t die to Doom blade? Atraxa, Praetor’s Voice, Meren of Clan Nel Toth, Breya, Etherium Shaper, Oloro, Ageless Ascetic and Nekusar, the Mindrazer, i.e. all five of the top five most frequently played commanders on EDHREC. Today, I make no demands… no threats! But, one day, I shall voice demands — and all shall obey them! First I think it’s worth touching on what Doom Blade does right. After all, it must do something right to show up in close to 8,000 decks. It is instant speed, meaning you can cast it in response to spells or as a trick. It is also cheap to cast, costing 1B, and that cost is easy on the mana base requiring only a single colored mana. Those are both positive things. So what does it do wrong? Well, mainly it doesn’t work consistently enough to be reliable. You know where I mentioned that all five of the top five most frequently played commanders are black? Well the trend doesn’t end there. Thirteen of the top twenty most popular decks feature black commanders, and 27% of the top 100 most frequently played creatures are black. Looking at creatures as a whole you’ll find that as of this article there are 9,228 unique creatures in the game of Magic, and 1,993 of them are black, meaning Doom Blade simply won’t work on 21.59% of total creatures. That’s not terrible, but it’s hardly reliable. So what comparable cards are more consistent? For starters I’m going to focus on cards that specifically target creatures. Abrupt Decay and Anguished Unmaking are both excellent cards, but both are more universal removal and not creature removal even if they hit creatures. I’m going to skip Fatal Push as well. In Commander you really need the revolt trigger, and unlike in Modern it is much harder to rely on fetch lands or cantrips to get it. I’m going to just focus on creature removal spells here or spells whose effectiveness we can consistently calculate. Rivals… No one rivals Doom! NO ONE! Doom is supreme! Looking at that data Doom Blade is almost always going to be a less reliable spell than Go for the Throat. Given a choice you should almost always run Throat. In taking a glance at the top 5 commanders most frequently using the card from the bar graph earlier in the article there are 172 of Phenax decks running the former and not the latter, which translates to 89% of Phenax decks using Doom Blade are not using Go for the Throat. Olivia Voldaren is at 54%, Rakdos is at 74%, Lazav is at 62% and Toshiro is at 24%. There’s almost no reason for every one of those decks to not make the change. As with Go for the Throat before it, it very much seems that significantly more often than not Victim of Night is a better choice for a removal spell than Doom Blade. The choice to go with Blade over Victim is even more perplexing in mono-black decks where the double black casting cost is largely an irrelevant difference. Ghoulcaller Gisa is the most popular mono-black commander on EDHREC, and 10% of the decks are running Doom Blade over Go for the Throat despite the fact that the double black casting cost will rarely matter. Devour in Shadow is fairly easy to evaluate. It does have a double black casting cost, but there are no restrictions on what you can kill. Instead, you lose life equal to that creature’s toughness. In a 40 life format that’s a much easier penalty to take. Just ask anyone who has seen me keep both cards off a Sylvan Library on four consecutive turns. Additionally, black is a color with strong lifegain mechanics. Even so, despite being mono-black, thus eliminating the BB casting cost handicap, and having lifelink baked into the commander 13% of the Liliana, Heretical Healer decks on EDHREC are running Doom Blade and not Devour in Shadows. Malicious Affliction is Doom Blade at the same CMC that gives you an option to kill two non-black creatures if another creature died this turn. As with Devour and Victim before it the cost does contain double black, but as with both those spell that really isn’t a problem in a mono-black build. The world must not lose a magnificent brain like mine! Orzhov Charm is one of the many excellent charms from the Return to Ravnica block. Like Devour in Shadow it lets you destroy any creature causing you to lose life equal to its toughness. On top of that it has two other semi-useful modes. Not only is this better than Doom Blade but it is better than Devour in Shadows, albeit slightly harder to cast. 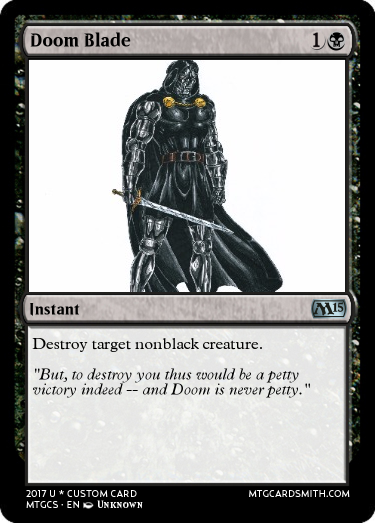 Terminate is just an excellent card in general, and there’s no situation where you should be running Doom Blade first in a R/B deck. Not only does it destroy any destroyable creature with no restrictions, but it prevents them from regenerating. It’s just better in every regard, and worth having to specifically spend a red mana over spending anything. Rakdos, Lord of Riots is the most popular R/B commander in the database, and among their number exist over one hundred decks running Doom blade and not Terminate. Normally I don’t like to delve too deeply into options at different CMC’s. Sure, you sometimes get more for the extra mana, but oftentimes that isn’t so much value as it is a consolation prize. The scry on Dissolve in no way makes it worth an extra mana over Counterspell. That isn’t always true, though, and sometimes the extra cost can in fact be worth it. I’ll pay the extra mana for a Skyshroud Claim over a Cultivate in most decks, for example. Before this day is ended, mankind shall grovel helplessly at my feet! That’s better than I had suspected. It is more effective than Doom Blade in every single category. It also can be cast for a single colorless mana if you’re willing to lose four life, or for the exact same cost as Doom Blade if you’re willing to lose two. Plus it also kills indestructible creatures as well as those that can regenerate. Kalitas, Traitor of Ghet has lifelink as part of his kit which helps offset the loss of life when casting Dismember, but 44 of the decks with him at the head are running Doom Blade over Dismember. Hero’s Downfall is better than Doom Blade. For one colorless mana you have no restrictions on what you can kill and you also get the option to kill planeswalkers, something that gets more and more relevant with each passing expansion. Yes, I understand the cEDH logic where you need to save every single mana possible to combo out on turn 2, but we’re not really talking about cEDH in this article as it’s not my area of expertise. I’d have to grow out a ponytail and start taking my waifu pillow out on dates to be able to really speak with any authority about the format. I’m kidding. Calm down cEDH players. It’s a joke. I don’t have a waifu pillow. I’d have to buy one first. Slaughter Pact is a Doom Blade that costs nothing to cast provided you pay one extra colorless over Doom Blade’s cost during your following upkeep. Is it worth a colorless mana in the cost to have the flexibility to kill something when you’re tapped out? That’s up to you, but in some decks it certainly could be. Since we looked at multi-colored options at two mana we probably should take a glance at them in three colors as well. Only Doom dares to dream! All others serve! Mortify/Putrefy are a semi-cycle from the original Ravnica block. Mortify lets you destroy a creature with no restrictions for three mana or you can destroy an enchantment. Putrefy lets you do the same except replace enchantment with artifact, and it also prevents regeneration. Both are excellent, though Mortify is competing with Anguished Unmaking, Utter End and Vindicate in those color pairings. I’d absolutely run Putrefy over Doom Blade however. Unlicensed Disintegration is the newest addition to this list and probably the weakest. For one added red mana you lose all restrictions on what you can destroy, and add a Lightning Bolt to that creature’s controller if you control an artifact. Odds are pretty high in a Rakdos deck lacking native ramp that you’ll control an artifact, so fairly often you can assume you’ll be getting the extra three. That said, three to the face is less relevant in commander than in a 20-life format, but it’s not nothing. Is it worth an extra red mana to chunk them out a bit and have no restrictions on what you kill? Maybe, especially given all the damage doubling options in the color pair. A commander like Rakdos, Lord of Riots also gets an added bonus from dealing damage, yet 160 decks with the legendary demon at the top of the list are running Doom Blade and not Unlicensed Disintegration. Editor’s Note: I will also point out you can choose to redirect that damage to a Planeswalker (for the moment), which also isn’t nothing a non-zero number of times. 3 to the face isn’t much in EDH, but 3 to a Planeswalker is another matter. Unmake has the least friendly of the three CMC spells as it requires all colored mana in some combination of black and white. However for that cost in addition to having no restrictions on what you can kill you also exile the creature, working around indestructible, preventing death triggers from the likes of Grave Pact and Wurmcoil Engine and making the target nearly impossible to recur. Like with Mortify, Unmake’s real competition for a slot isn’t with Doom Blade so much as it is other cards, namely Path to Exile and Swords to Plowshares, but it is another card that I’d still run first. The star Doom follows beckons only to him… and none other! If you’re still running Doom Blade odds are one of these options will work a little better for you, and over time a bunch of a little betters adds up to a lot better. I’d love to hear your perspective on all the Doom Blade variables, as well as any suggestions for future cards to cover in the column. Until next time, I’m Dana, and I’ll see you In the Margins.